The spider has been recorded from a few sites in southern England. It was recorded from Great Kimble in Buckinghamshire and from the New Forest in South Hampshire early in the 20th century. More recent records are scattered in central southern England. 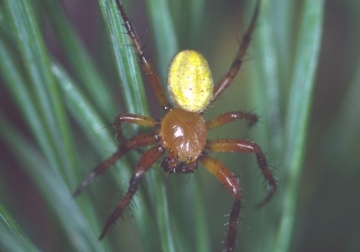 In Europe the spider is widespread but uncommon. Woodland. A. alpica has been recorded from trees, particularly yew and beech. It has also been found on dogwood Cornus sanguinea, and in chalk grassland (at Melbury Down) but this was in close proximity to woodland. Mature males and females occur in May and June. The spider has undergone a major decline in area of occupancy. Although identification of Araniella spp. requires critical examination under the microscope, males at least are likely to be recognised in the field by arachnologists as having sufficiently distinctive coloration to mean that it is unlikely to be under-recorded. Records should however be confirmed by experienced arachnologists familiar with this species. The loss of old yew and beech woodland and also of woods containing mature stands of these trees. Where woodlands in the south of England contain ancient and mature yew and beech stands management to encourage their continued presence would provide the most suitable conditions for A. alpica, but more information is needed on the ecology of this species. Half the known sites have SSSI designation, one of which is owned by the National Trust.